Managed to sleep until 10.30am this morning, think we all needed it. We went over to pepper market at 11.30am for lunch. 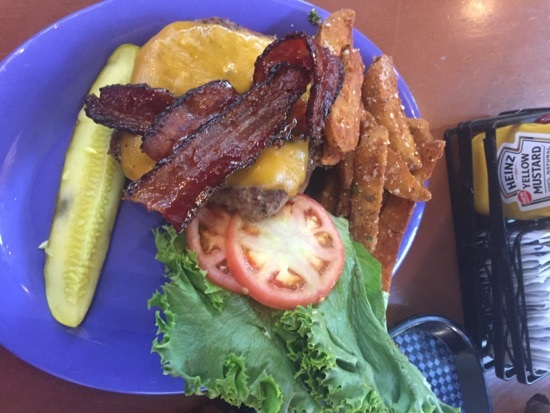 DD and I shared the Texas burger with Parmesan wedges. This was a burger with cheese and BBQ bacon, lettuce and tomato. It was absolutely lovely, we ate it all. The wedges were really good too, something abit different from the usual fries. This should have been $13.99. 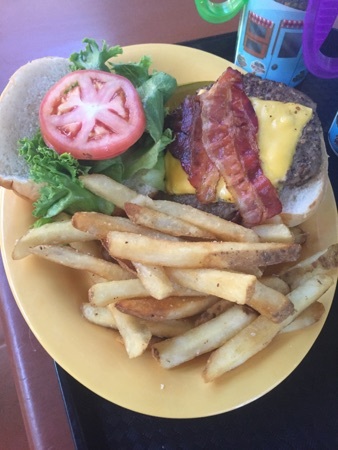 DH had the regular cheeseburger with fries. He wasn't too impressed with this and left some of it, not upto usual Disney burger standards. DD and I shared a large chocolate chip cookie for dessert. 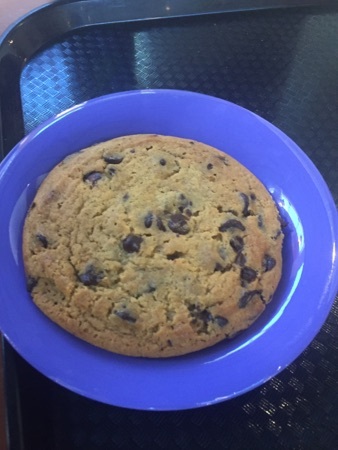 I let DD pick whatever she wanted, I wouldn't normally go for a cookie but this was lovely, it was really soft and gooey and had loads of chocolate chips in; good choice! 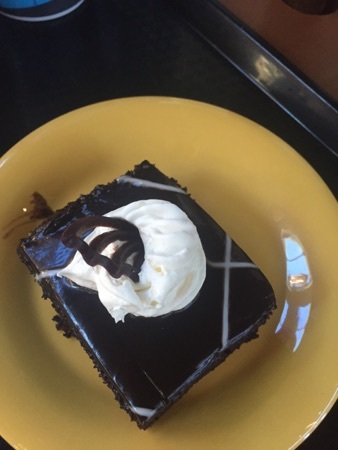 DH got chocolate cake for his dessert and also shared this with DD, they both really enjoyed it. This meal should have been $39, we got 2 bottles of water to take with us as we had taken our refillable mugs to use for drinks. After some pool time we headed to Disney springs to spend some snack credits. 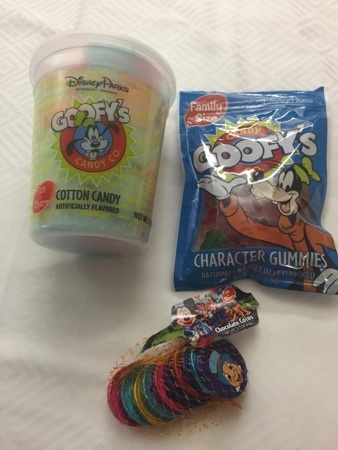 We used the 3 birthday snack credit for Emily from Mickey on whatever she like, she picked some cotton candy, chocolate coins and a bag of gummy sweets, this should have come to $12. 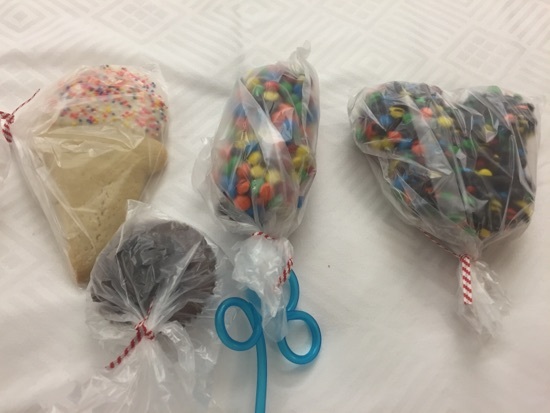 We also got a ice cream novelty cookie, marshmallows dipped In chocolate coated in m&ms, a Mickey peanut butter cup and a rice crispy treat dipped in chocolate coated in m&ms. These should have been $20 but we used 4 snack credits. I have photographed then in their wrappers as we have put the in our fridge to eat as we fancy so I will photograph each one properly as we eat them. 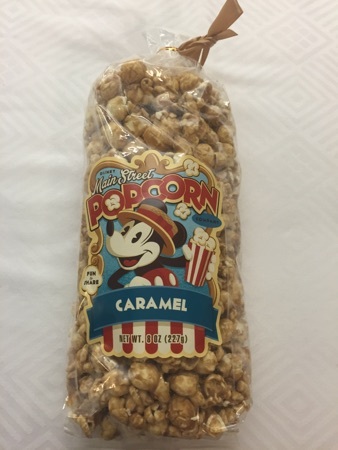 We also picked up a caramel popcorn, we paid cash for this as it doesn't count as a snack credit and cost us $5.99 excluding tax. After our wet trip to Disney springs we headed to animal kingdom for our dinner reservation at tusker house. I apologise for the quality of the pictures as the restaurant was very dark. 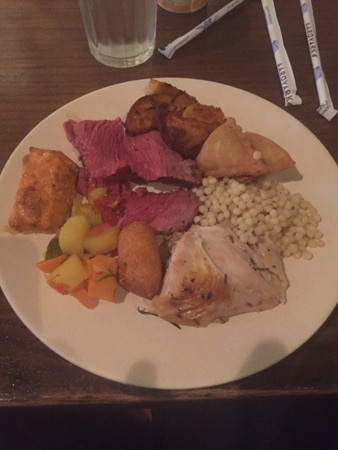 The buffet had a nice selection including carved roast beef which was served rare and was melt in the mouth and so delicious, vegetable samosas, turkey, pearl barley, wedges and vegetables. 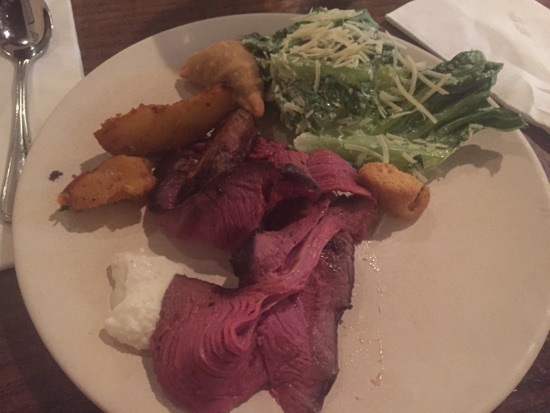 I had some roast beef, horseradish cream, Caesar salad, vegetable samosa and wedges. 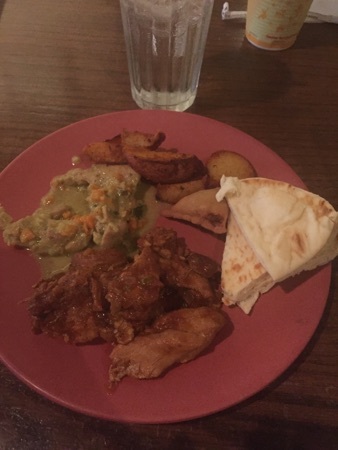 This was 2 different curries, one was Thai chicken curry, with some pitta bread,?wedges and samosas. 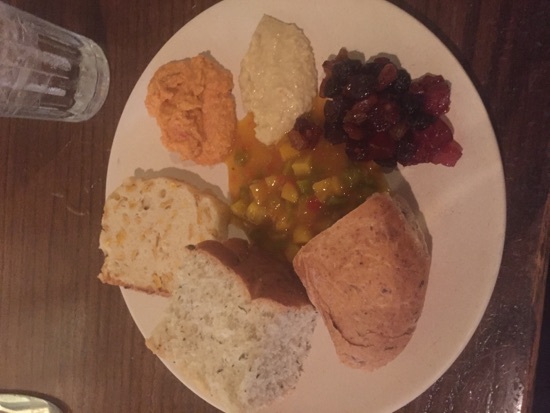 They had a large selection of breads including focaccia, pitta, cornbread and a bread with corn in. There were also 2 different hummus' that were both really tasty. 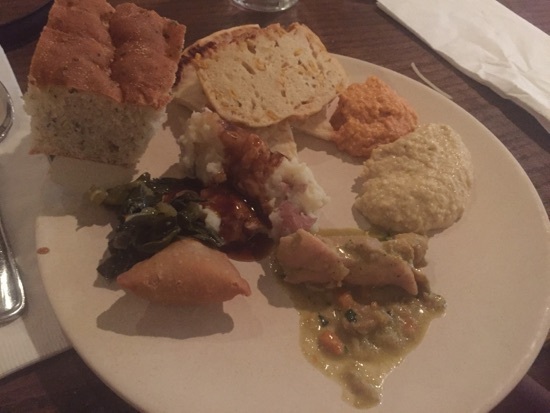 Here's another buffet selection that DH got. 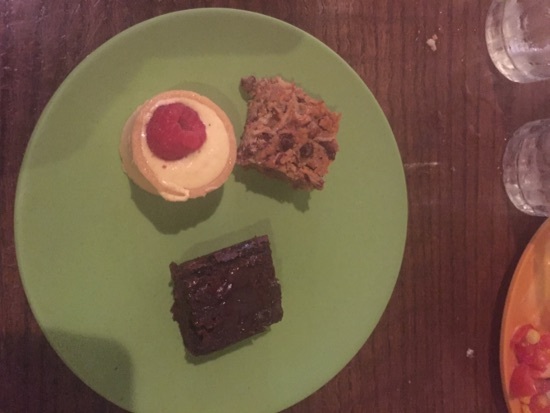 The dessert selection wasn't great in my opinion, the best was a oaty cake bar with chocolate chips. The tart was ok and the chocolate brownie was abit bland. 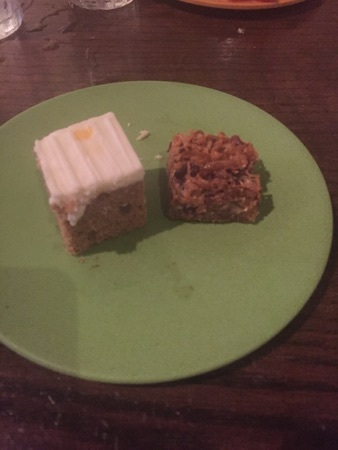 Dh tried the carrot cake and said it was good, but agreed the cake bar was the best. 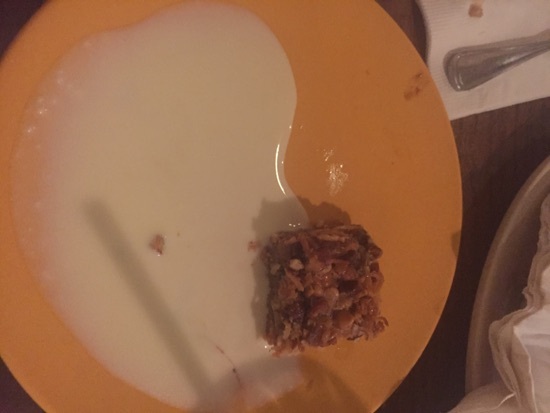 They had banana bread pudding with vanilla anglaise, so I tried the vanilla anglaise with the cake bar and it was good. Overall we weren't overly impressed with tusker house, we met Mickey, goofy, Donald and daisy and the character interaction was pretty good but the food was average on the whole with a couple of stand out parts. It was $49 for adults and $30 for children. We each used a table service credit. I don't think I would pay cash for this meal, it certainly wasn't as good as Hollywood and vine. New Photo Added by missdopey - 3 Jul 16 3:46 AM. Those treats from goofs candy are mouth watering, I love the m&ms ones. Love the sweets, chocolate covered marshmallow - yum! We love Tusker but do feel we've 'done' it now and will try somewhere different next holiday. Good use of snack credits. I'm never sure about Disney buffets (except for Boma) but the beef does look nice! Love Pepper Market though! I wasn't overly impressed with tuskers house especially as we pay oop.